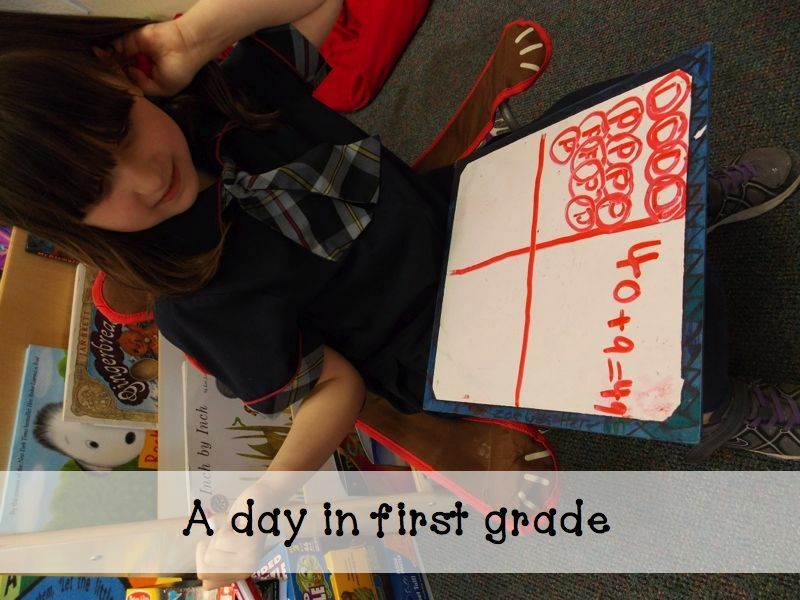 A Day in First Grade | Math Questions: Answered! Hello everyone. How many of you had a snow day this week? Last night the district that we follow issued a two hour delay and then this morning, right before I was about to leave, they cancelled school for us! Such crazy weather we are having! 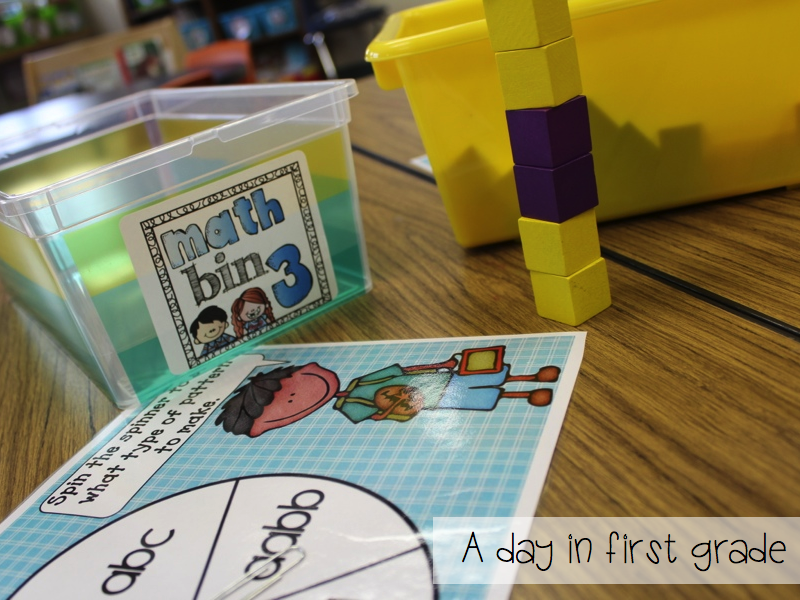 I had many people ask me questions to explain how I introduce math bins and how I teach during my math block and I thought I would try to answer some of them here! 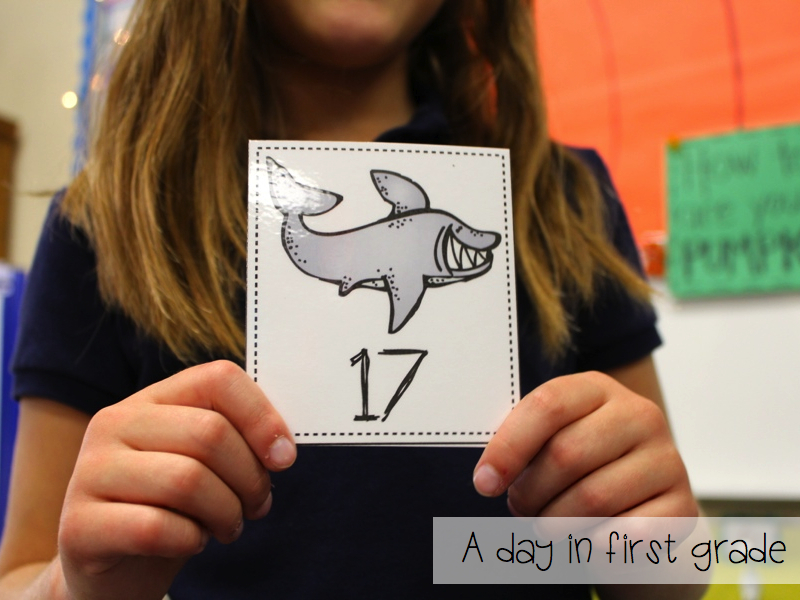 The easiest way to describe how I teach math is to run you through a week in my classroom. Many people emailed me and messaged me asking how do I teach my students HOW to do their math bins. They also asked how I avoid behavior problems. I have done this a few ways but they way that I am doing right now is working really well and it’s allowing me to meet the variety of needs my students currently have. 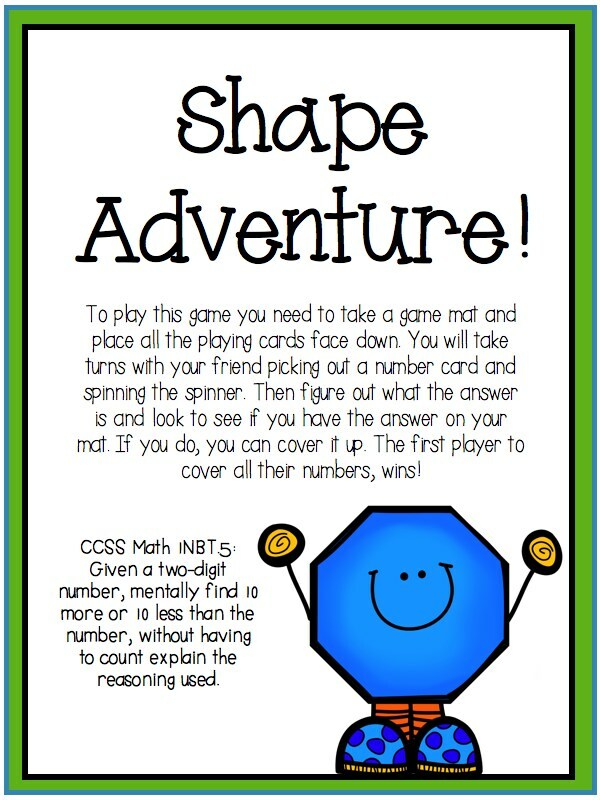 If you use the math bins that I create, you will notice that I tend to use similar games. I change them up slightly so my students’ interest levels remain high; however, not too much that they will not know what to do. 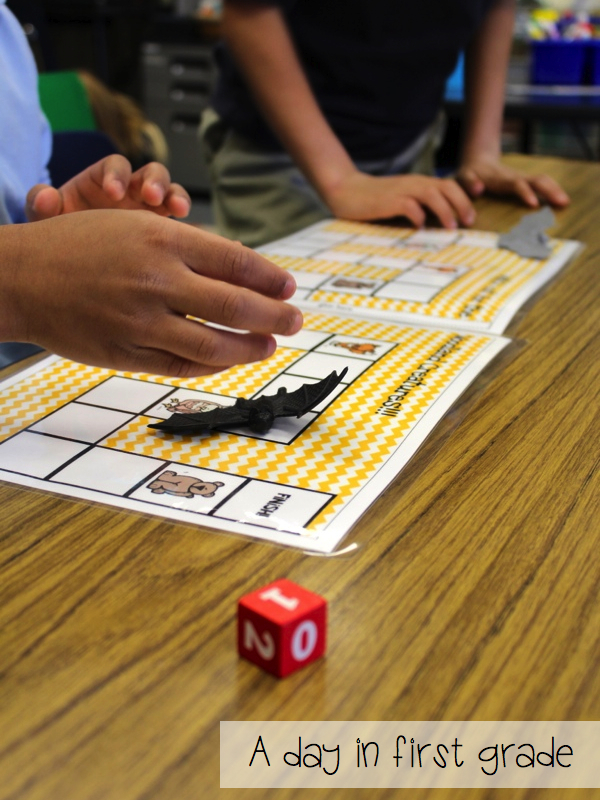 Many of the games that I use are also games that I use when I teach my whole group lessons. 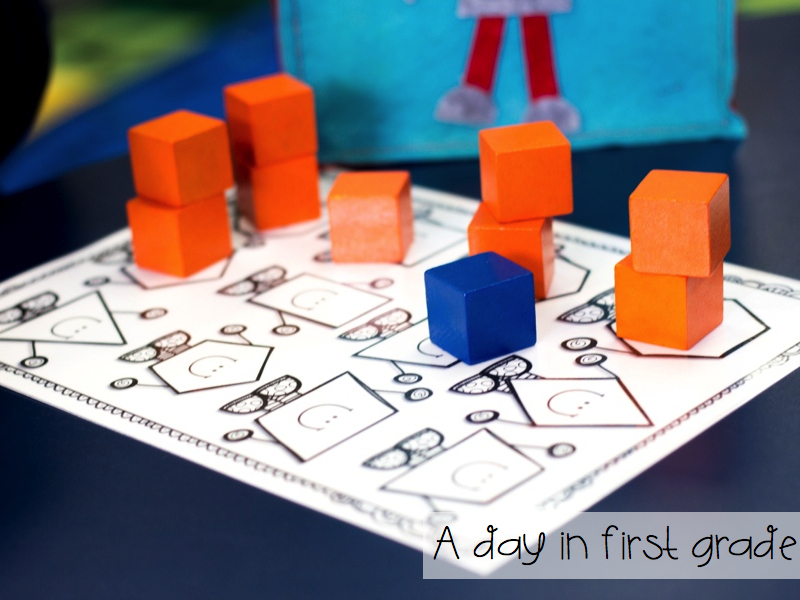 I LOVE to teach through games. I have found that any concept turned into a fun game is retained so much more. Therefore, when I teach a new concept, I keep this in the back of my head. 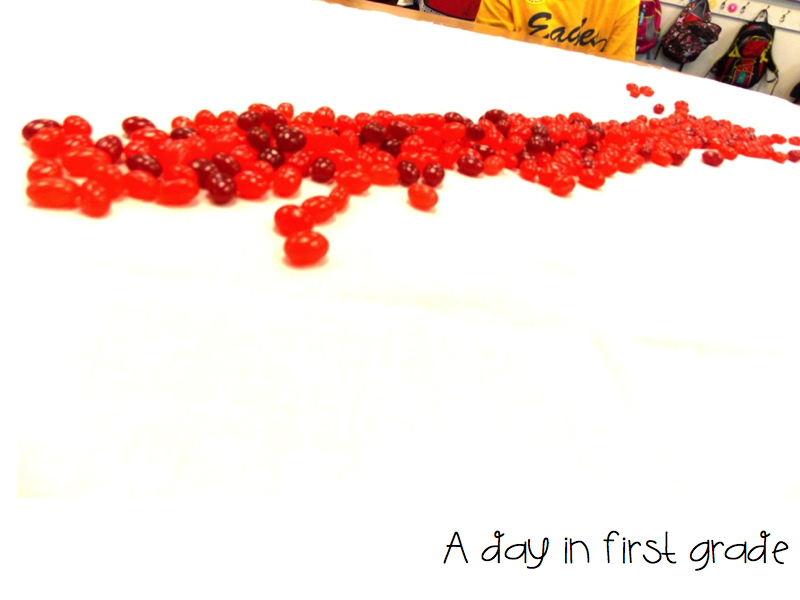 Here is a glimpse into our day in my classroom. Our message for the day reviews concepts that we are working on. 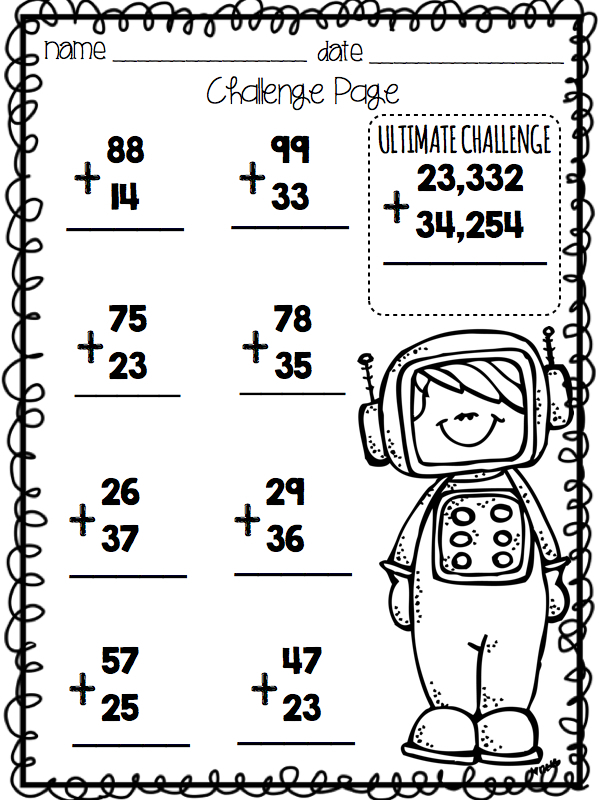 After we go over the normal calendar things my students will occasionally (2-3x a week) have a math challenge that they complete on their white boards. 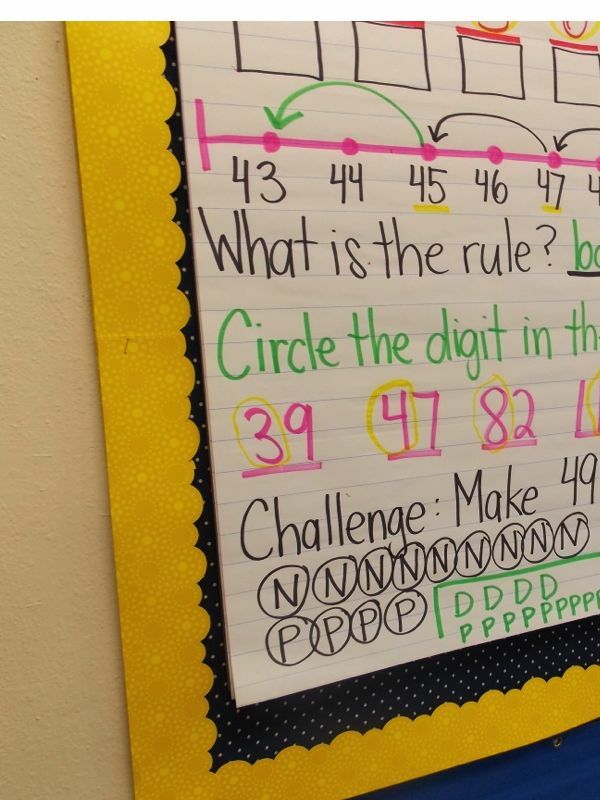 These challenges can be anything from “Make a number four ways” to writing word problems. This whole “calendar portion” of my class takes at most 20 minutes. We start with a whole group lesson. 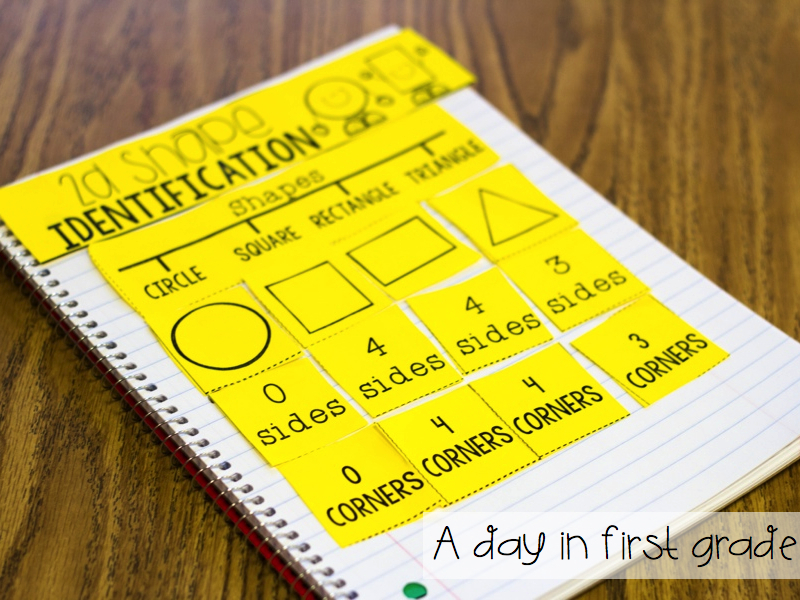 (10-20 minutes) This could be teaching a new concept, reviewing an old concept, or introducing a math bin game. I start my lessons with a quick warm up. 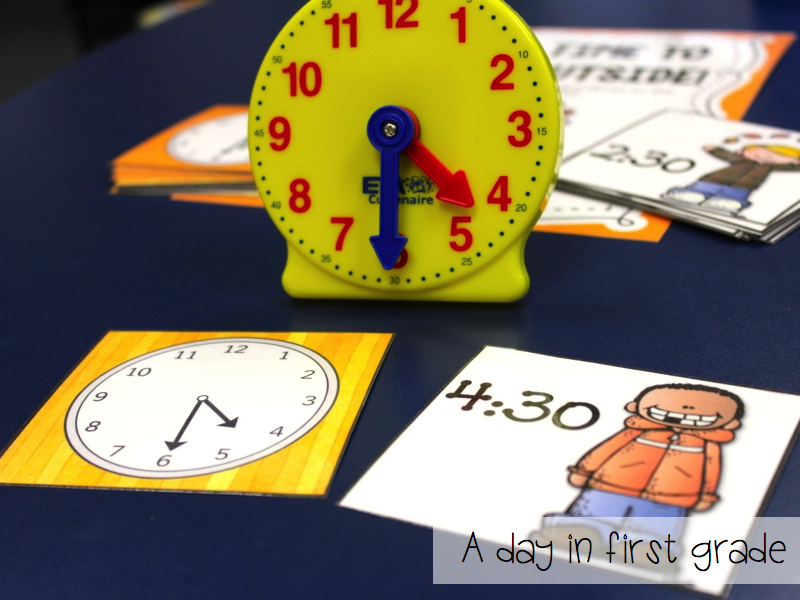 (examples include: fact fluency, (flash card games) turn and talk to your friend and tell them everything you know about even numbers, or skip counting) After the warm up we have a brief mini lesson. 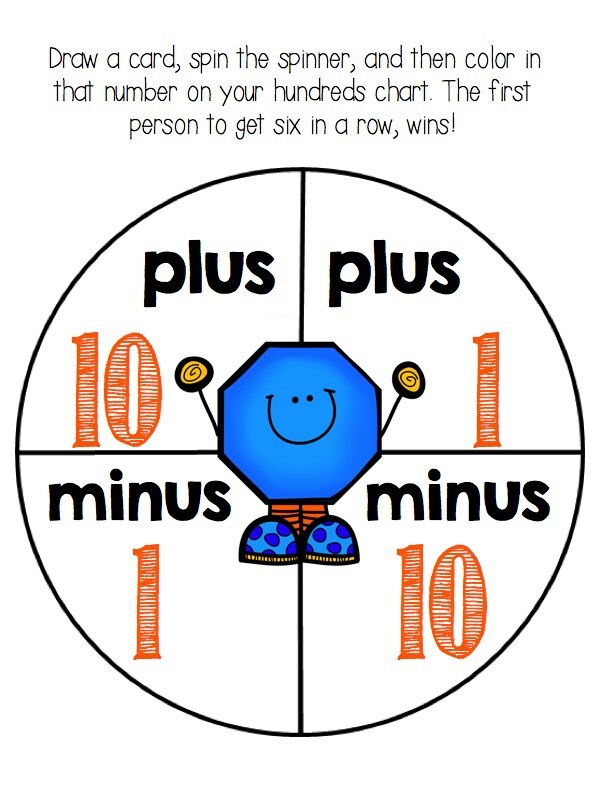 This next lesson was reviewing greater than and less than. From my whole group lessons, we do one of two things. 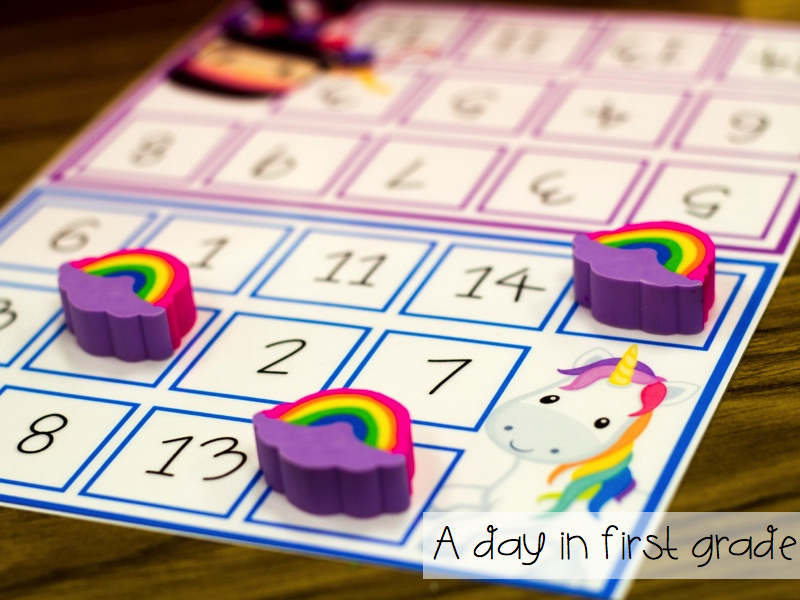 Some days we will go right into our Guided Math rotation time and other days we will have some guided practice. 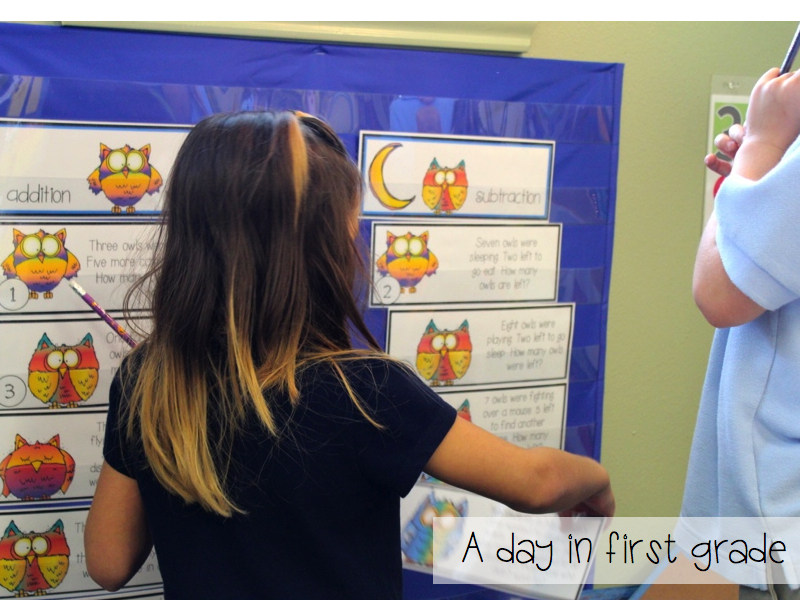 Guided practice is basically a way for all of my students to work on the same concept in small groups. 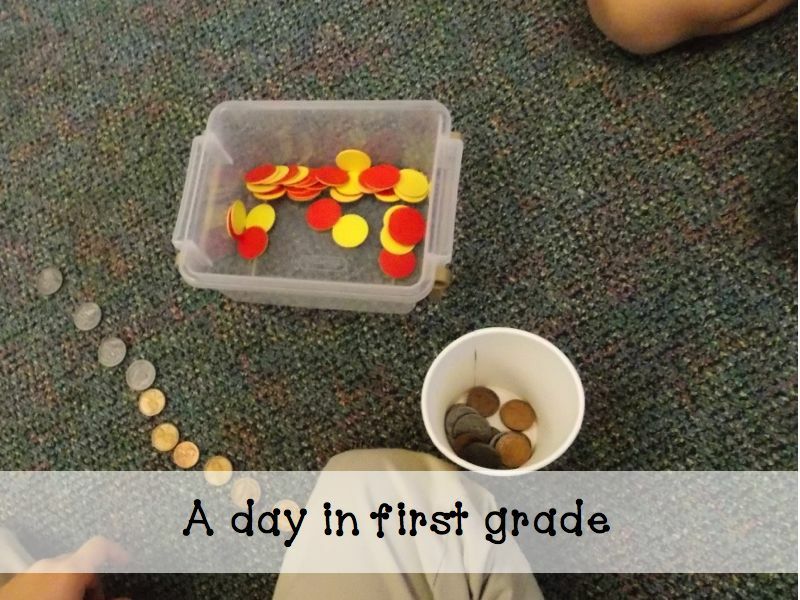 On this day, my students were practicing counting coins. After a ten minute whole group lesson on counting coins, each student got a cup of coins, some chips, and a partner. My students then took turns taking out a small handful of coins without looking and practiced counting up how much money they had. Whoever had the most amount of money, then earned a chip. The first person to earn 6 chips, won! 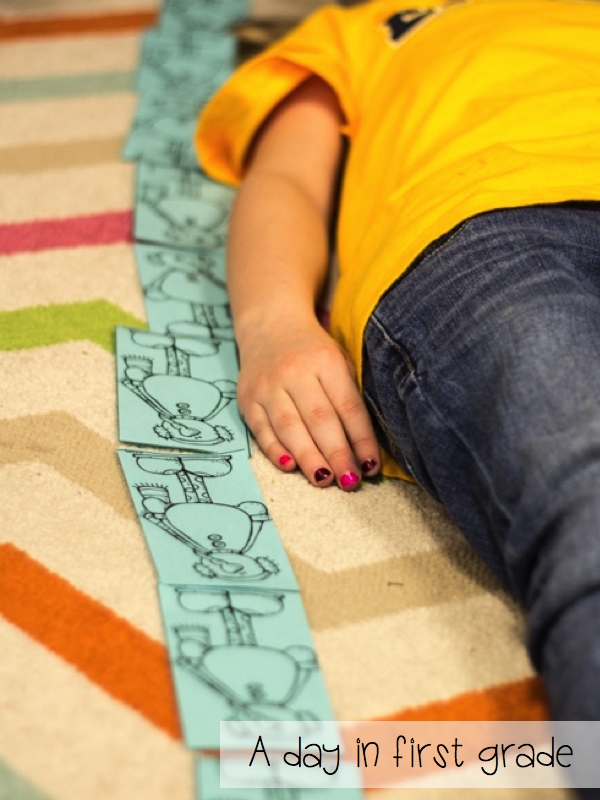 Counting large groups of objects and other fun hands-on lessons. 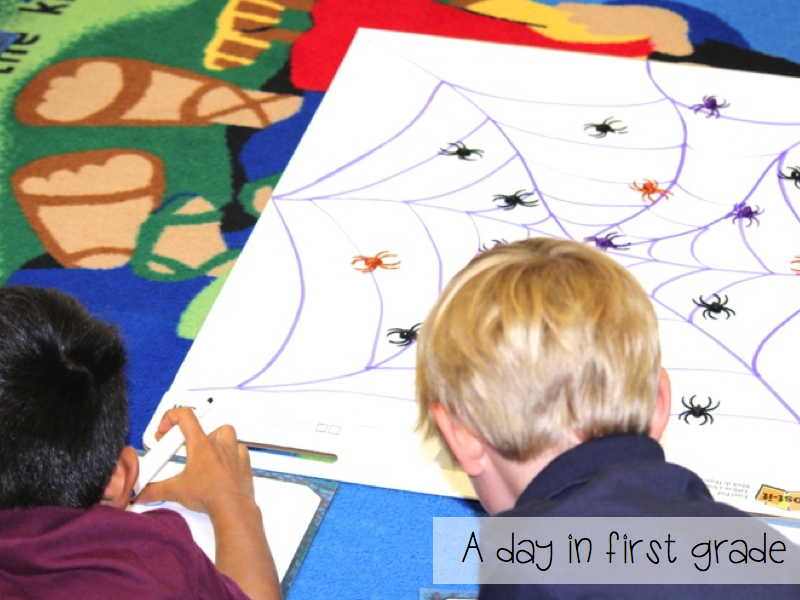 During our guided math time with me, I am teaching and reteaching concepts that my students need practice on. Again, I use many games and math bins to do this. During this time my students are reviewing exactly what they need help with, with me and students who are needing help with the same skills. I use my math bins to help make this fun. In October, we were working on time to the hour and half hour. This then became a math bin after we had practiced it together. We also were practicing adding and subtracting ten from any given number. This week, (I don’t have any pictures yet) we are doing a similar game. Because we did a center like this in October, my students know exactly how to play the game and are beginning to master the skill. 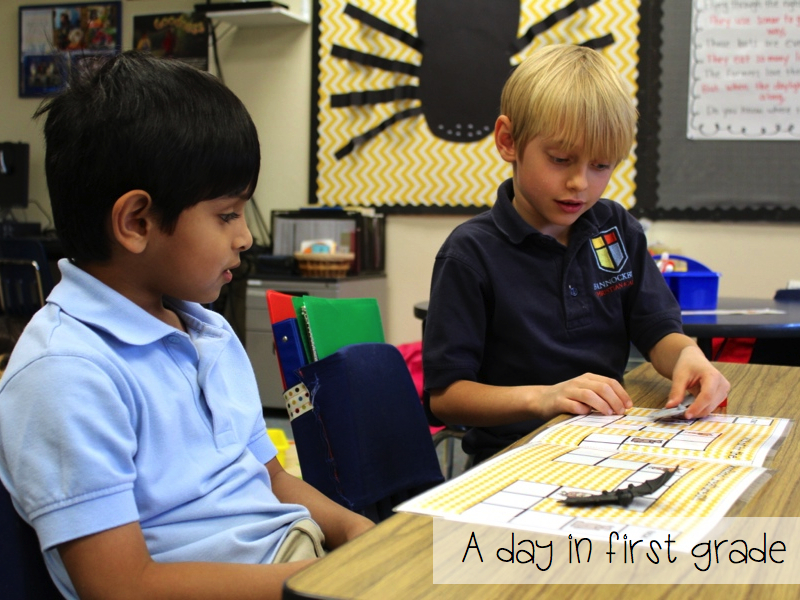 In the beginning of the year, we spend a log of time going over how to play certain math games. 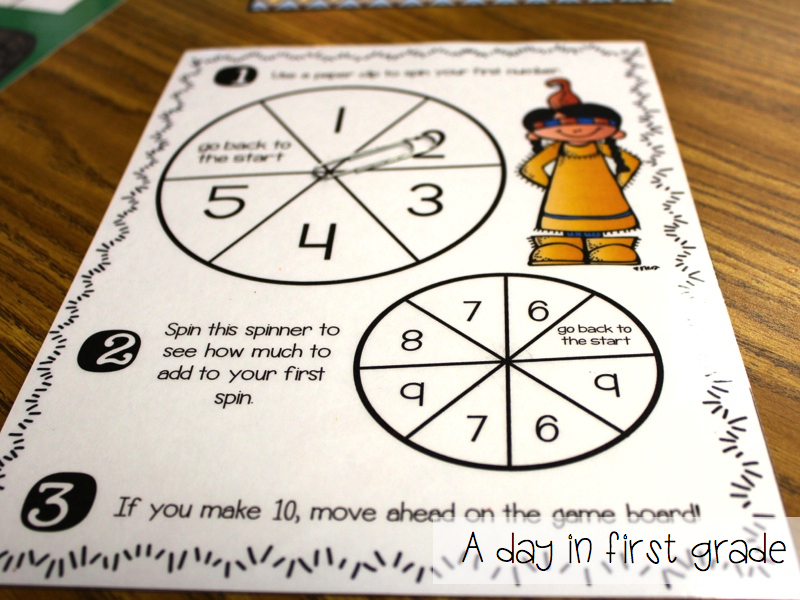 We played a lot of sorting games, spinner games, and board games to help my students get ready to know how to play our games. At the beginning of the year our centers look like this. In October and November, the concepts of the games got harder, but my students knew how to play the games. 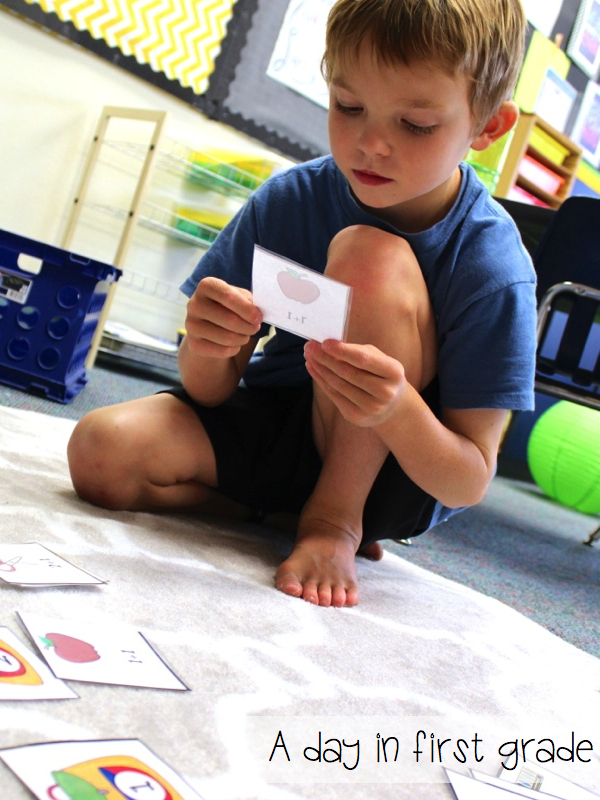 Now the games are similar, covering up sums, spinning for the difference, sorting cards, and solving problems; however the sums are greater, the problems are harder and the skills have increased in difficulty. As I said in my last post, I have 6 math bins in my Math Bin area. Each day, before our math block I place the things that we are working at on different tables or at pocket charts. Each day the students will only work on TWO math bins. During the math block they also have to complete either a math page from our curriculum or a page in their math journal. They will read Math books, play games on our ipads, and meet with me. It takes some planning to get it started, but once you get into a routine, it becomes fairly easy to maintain. My students know what to expect and are very happy during our math rotations. They are learning a lot and applying all of their math knowledge and skills during their rotation stations. 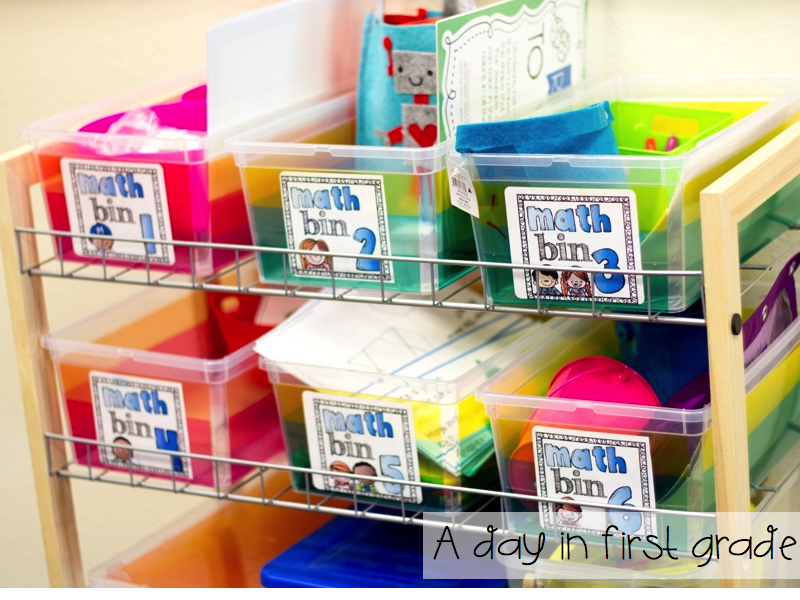 How often do you switch out math bins? Honestly, give or take once every two weeks. 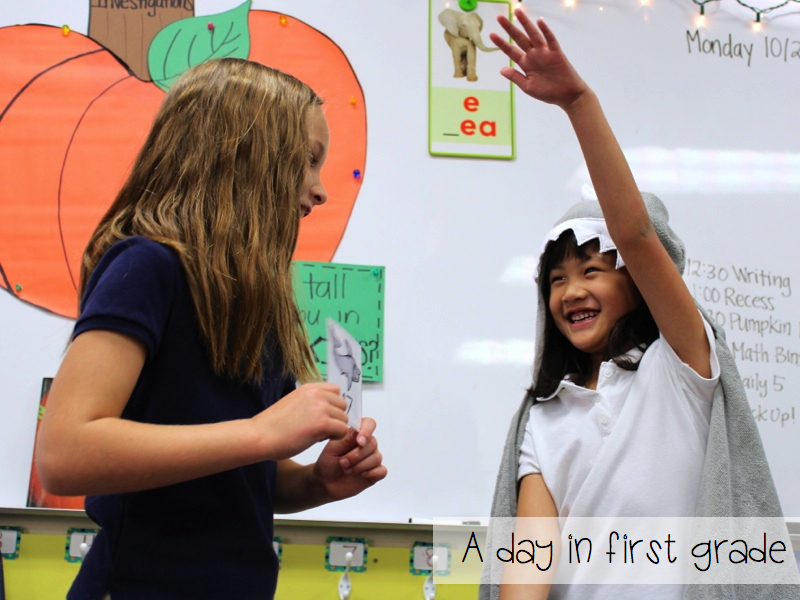 Mondays and Fridays are normally a day of introducing a new math bin or a guided practice day. Therefore my students are with my in math rotations Tuesday, Wednesday and Thursdays. 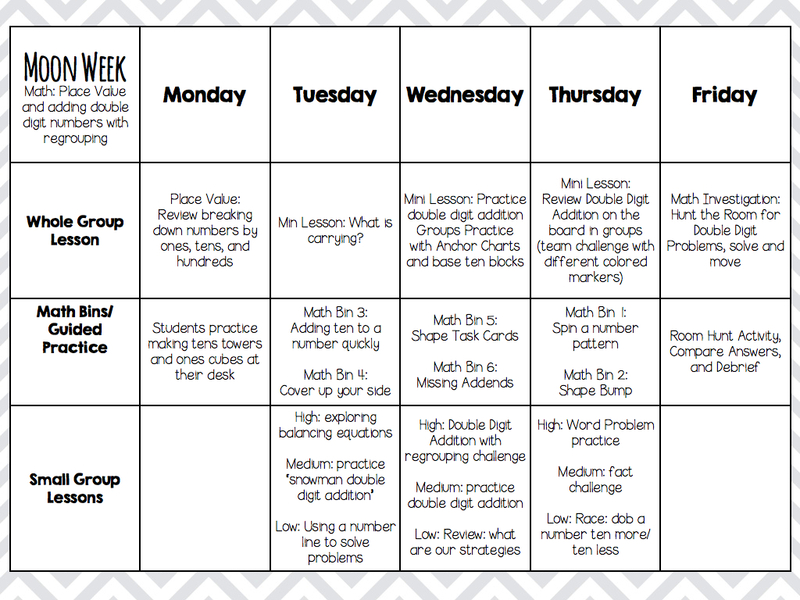 (Tuesday: Math Bin 1 and 2, Wednesday: Math Bin 3 and 4 and Thursday: Math Bin 5 and 6.) 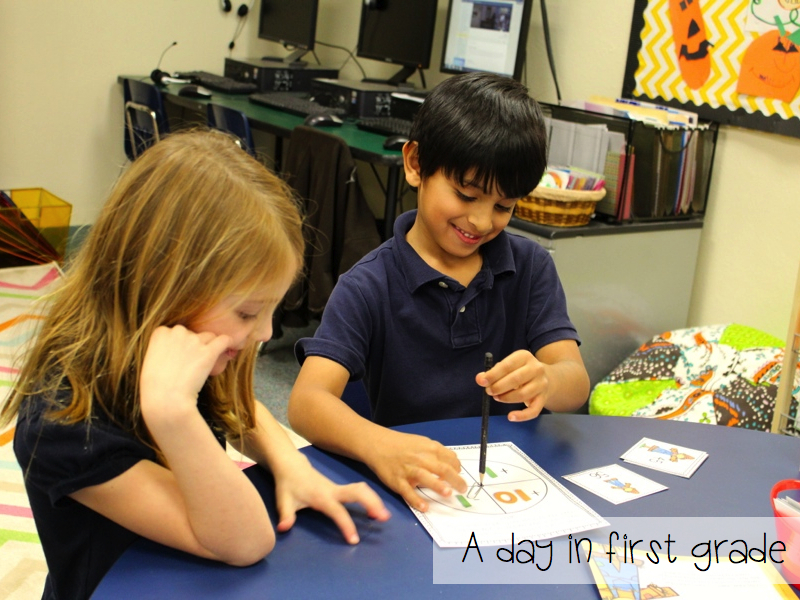 We play the games for two weeks (so they play each bin two times but during different weeks) and then I switch them out with activities that were guided practice games or Guided Math Games. What do you do if your students don’t finish their journal? It depends on the student. If my students do not finish their math journal or page sometimes they will have to miss the book or iPad station and finish their work. Other days, if they were working really hard, I let them put their pieces in a baggie and they can complete it when they have free time. What do you do if your students are misbehaving? I very rarely have this problem. I’m sorry. Students know that if they are too loud or misbehaving in my classroom that they will move their clip down or miss the iPad station. This tends to be enough in my classroom. One thing that helps me is that I never have a group with more than 3 kids. What does my math block look like this week? Unfortunately, this week my curriculum is covering a topic that I know most of you who teach first grade no longer teach under the common core standards. This week our concept is “double digit addition with regrouping.” Here is what my week looks like. 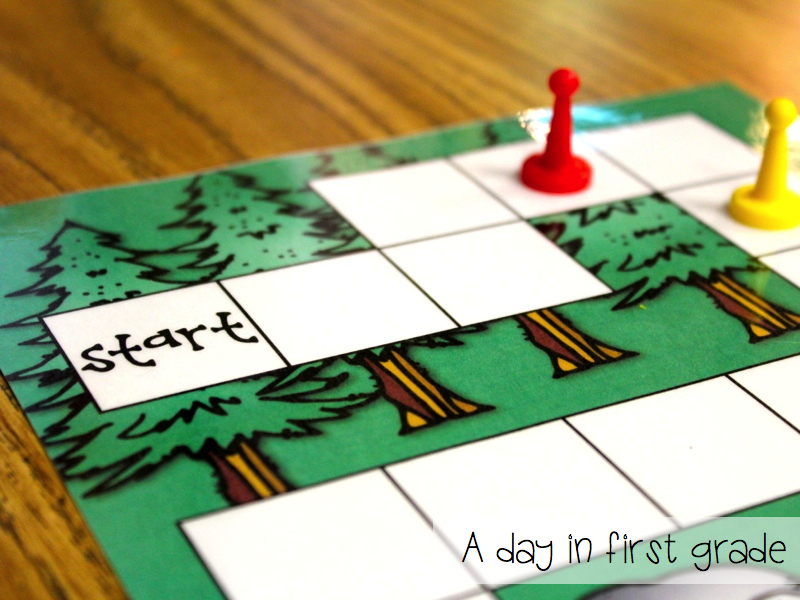 This might give you an idea on how I plan and how I set things up in my classroom. On Friday we will hunt the room for these problems and record them on a recording sheet. For some additional practice, my students will use worksheets and problems like this to help them fully grasp this concept. You can have them for free by clicking HERE. 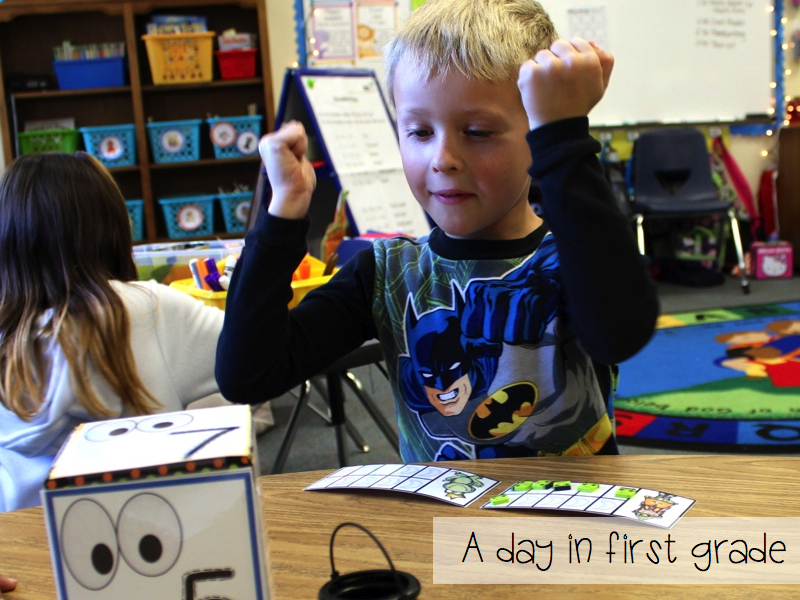 All of the activities in this post are from math bins that I have created. If you are interested in them click on the February cover below to get taken to my store. Love the way you explained this. I am wanting to change my math block and I’m always looking at how other teachers do their math. I really like the way you do math. I’m curious though if you have a math book you are required to use? I would love to teach math this way but I struggle with how I would fit in the required curriculum. 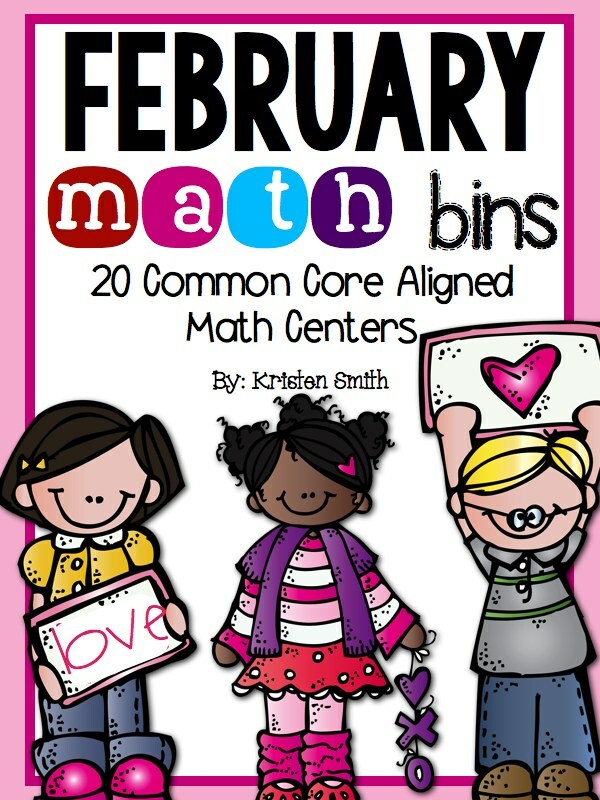 Kristin- We do have a math curriculum– it’s how I plan my scope and sequence. I take the big ideas from the curriculum and then modify, expand, and include student exploration. We are required to teach all of the TEKS (the Texas standards) and are given our curriculum as a “road map” to teach our students. 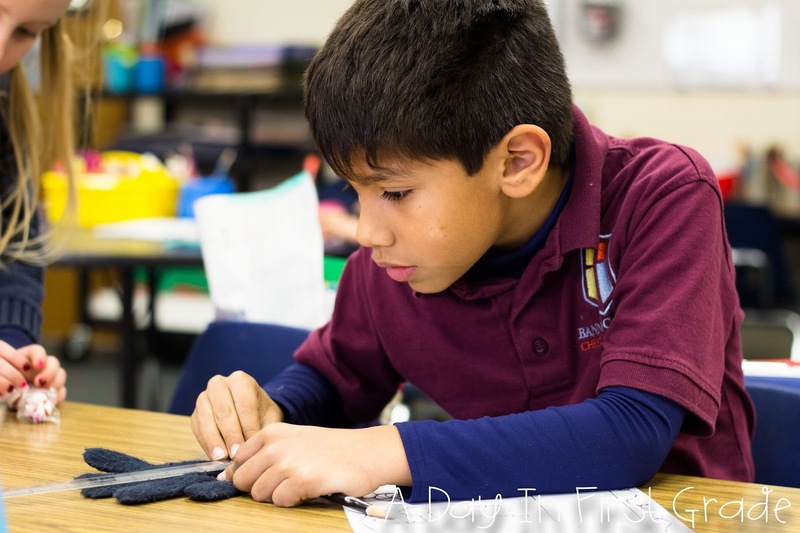 To plan for my weeks and months, I look at my curriculum’s plan and the TEKS and teach those big ideas each week. The curriculum that we use does not have a student book, it has student pages that I use 2-3x a week during their rotations (those pages would be at the journal station). Honestly, my students get more out of the math bins, exploration, small groups, and math journals than they do the math pages. Our principal just wants us to teach our students the required standards and bring them as far as we can. This is so interesting to me! How many students do you have that allows you to break them up like you do? I have 13 students this year. I love your explanation of Math centers!! What a great explanation! I was one that had emailed you with further questions, so I appreciate the time you took to explain it!!! I just finished cutting out my February Math Bins from you! I am loving my math rotations! I did buy the station timer from Stephanie McConnell, but then I made one on my own and personalize it for my kids with their favorite songs. They love it! I would love cold weather or rain…in California we have been 70 degrees plus…heading for major drought!! 13 Kids, what a dream! Small groups arent so small with a class of 26. Where do you get your math messages from? 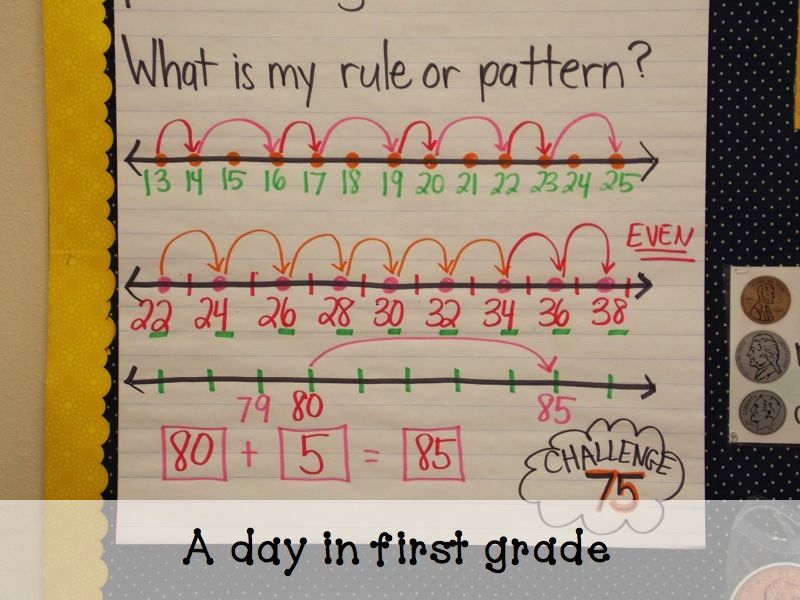 Do you create a new chart each day or reuse them year to year? I love all the information in this post! 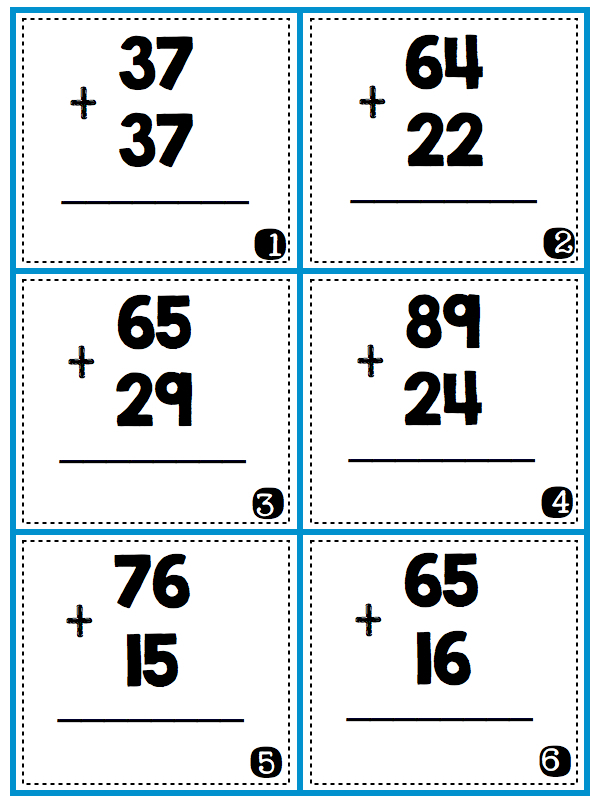 Quick question… for your morning math message do you use a packet or curriculum for this? Or is it just basically skills you come up with? Thanks! Mandi, my math messages always review a skill that we are currently studying. While technically they are not from a curriculum, the skills come from the one I use. Do you have the labels for your math bins available?